Of course we know we should eat our greens, but last time we ventured to the market, the ‘greens’ options were ENDLESS. With so many different shapes, sizes, variations in color, sometimes we don’t know where to start either. So we pulled together a Greens Cheat Sheet so you know which leafy bunch to reach for. Taste: A cross between lettuce and cabbage. Best eaten: The stalks can be eaten raw, but it’s best to cook (steamed or sautéed) – and cook it quickly so the stalks stay crisp and the leaves stay tender. How will I know when I see it? It looks like the lovechild of celery and romaine. To pick: You want dark green, glossy leaves and bright white stalks. Brown spots can mean poor storage/ flavor loss. 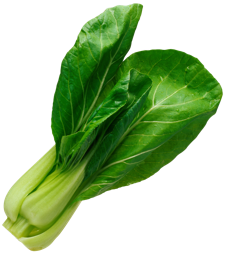 To cook: Cook baby bok choy whole, chop older/ larger bok choy leaves before cooking + steamed. But cook it quickly so the stems stay crisp. Taste: The leaves taste similar to beet greens and spinach – a little bitter. The crunchy stems are slightly sweet. Best eaten: Cook the leaves like you would spinach and the stalks like asparagus. If juicing, de-stalk it. How will I know it when I see it? Look for red/green leaves attached to brightly colored stalks. To pick: Look for vibrant color and unbruised leaves and stems. The leaves should be firm and not wilted. To cook: It cooks quite quickly when you sauté or braise it, but you can also eat it raw. The hearty leaves can hold up well without wilting in salads like kale. Both leaves and stems are edible. 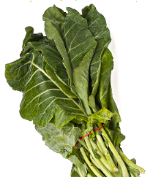 Taste: Collards have a taste similar to that of Kale but milder. Best eaten: You can eat raw, but most people like them lightly steamed. How will I know it when I see it? They have large, nearly flat leaves. To pick: Look for collard greens that are bright and crisp. If you hold up a leaf, it should stay taught. To cook: Blanch in simmering water quickly to lessen the bitterness. They usually cook within 5 minutes. Taste: Earthy, nutty and pleasingly bitter, similar to endive or radicchio. Best eaten: Raw or cooked. It retains flavor and nutritional benefits either way. Smaller, more tender greens are better eaten raw. How will I know it when i see it? 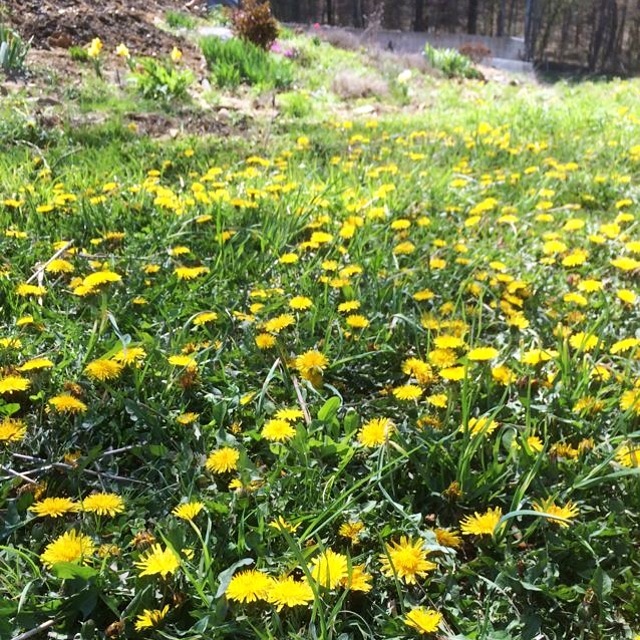 Look for a dandelions – yes the weed — and look at the leaves around them. They are pointy and long. To pick: If you are foraging, avoid areas where weed killer might be sprayed such as highways, sidewalks, and your yard. Grocery stores and markets also sell them for a safe bet. To cook: You can eat them raw, steamed, boiled, sautéed or braised, but bigger greens are better for cooking because they are more tough. Taste: It is almost exactly like radicchio. Best eaten: Escarole can be eaten raw or gently cooked – but don’t overcook. How will I know it when I see it? It looks a lot like romaine lettuce, with a bit lighter center. To pick: Look for unwilted leaves. Note the outer leaves that are darker are more bitter, so if you are looking to eat it raw, look for smaller, lighter bunches. To cook: The curly leaves can trap dirt and sand- wash even more thoroughly than your other greens! Taste: A bit like swiss chard / collard greens – mild, with a delicious hint of bitter. 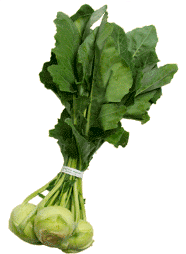 Best eaten: Kohlrabi greens are thick and taste best when cooked or steamed. How will I know it when I see it? They are attached to kohlrabi, which is one of the most unique-looking veggies, so you can’t miss it. To pick: For raw eating, look for young, small and tender leaves. If you are using them right off the kohlrabi, they will likely be mature and thick – good for cooking. To cook: Most greens are traditionally cooked down in a stock or flavorful broth. Be sure to separate and discard the ribs and then sauté the leaves in olive oil and garlic. Best eaten: Cook to retain color, bring out flavor, but can also be eaten raw. How will I know it when I see it? They don’t all look the same. 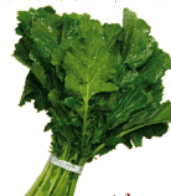 Some varieties are more frilly/ curly than others, but the frilliest dark greens are usually mustard greens. To pick: Unblemished and free from any yellowing or brown spots. They should look fresh and crisp and be a lively green color. To cook: Take advantage of their spice and add them to a neutral dish for a punch. Taste: Totally unexpected: like a tart, sour green apple. 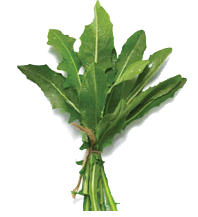 Best eaten: It’s an herb so you can chop it up and mix in a salad for tartness, or toss it into a cooked dish. How will I know it when I see it? 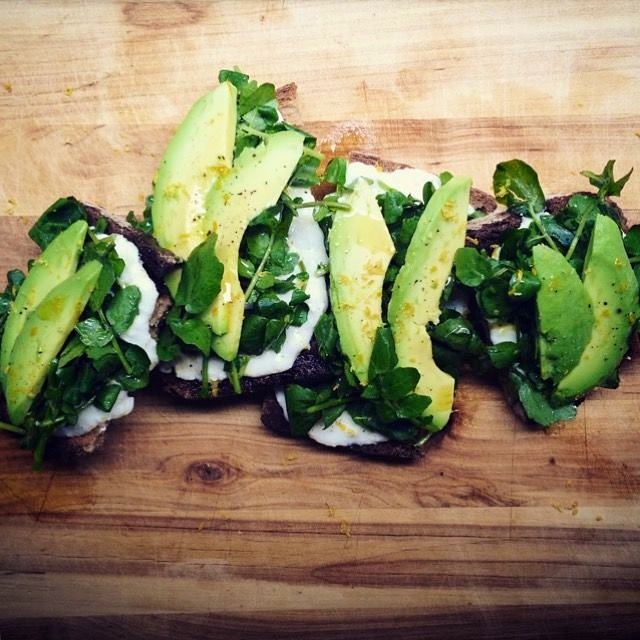 You might mistake it for arugula or spinach! Look for a swordlike elongated and tapered shape. 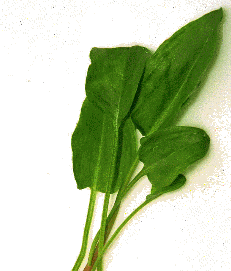 To pick: Pick fresh sorrel leaves when they are young and tender, just 4 or 5 inches tall. To cook: It is tart and acidic, and compliments creams and fats as well as meats and fish, and even adds freshness to basic potatoes. Either chop and add in raw, or add in like you would other herbs. Taste: Turnip greens are slightly bitter, like their cousin, collard greens. Best eaten: Cooked – steamed, braised, or sautéed. They are a bit bitter, so not everyone likes to eat them raw. How will I know it when I see it? Well, they’ll be attached to our friend, the turnip! Turnip greens give you more bang for your buck if you’re already purchasing turnips. To pick: Choose fresh looking, young tender deep green leaves. Look for small, healthy, firm turnip tubers. Avoid yellow, sunken, wilted, or over-matured leaves. To cook: Boiled the greens quickly after sprinkling with lemon juice and letting them sit for 5 minutes. 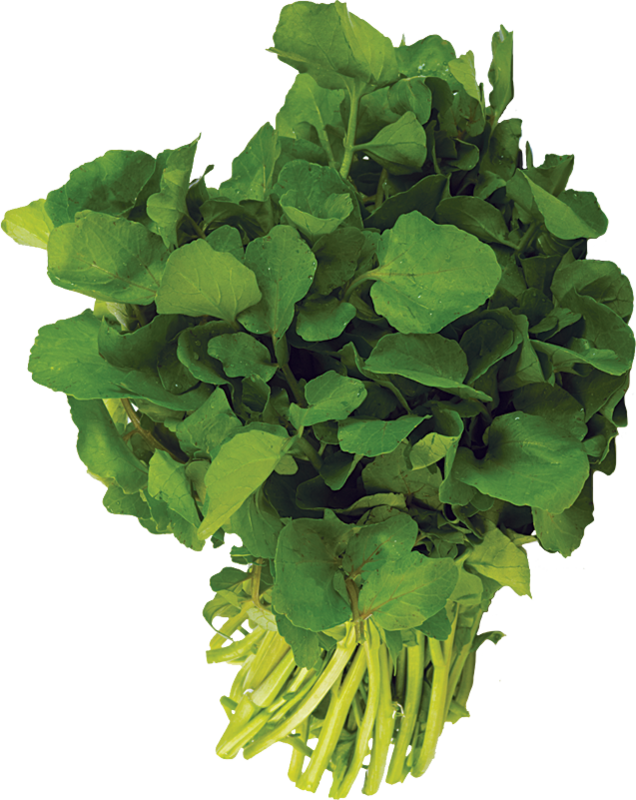 Taste: Watercress is known for it’s peppery spiciness. Best eaten: Raw as the base of a salad, or cooked in like other greens. 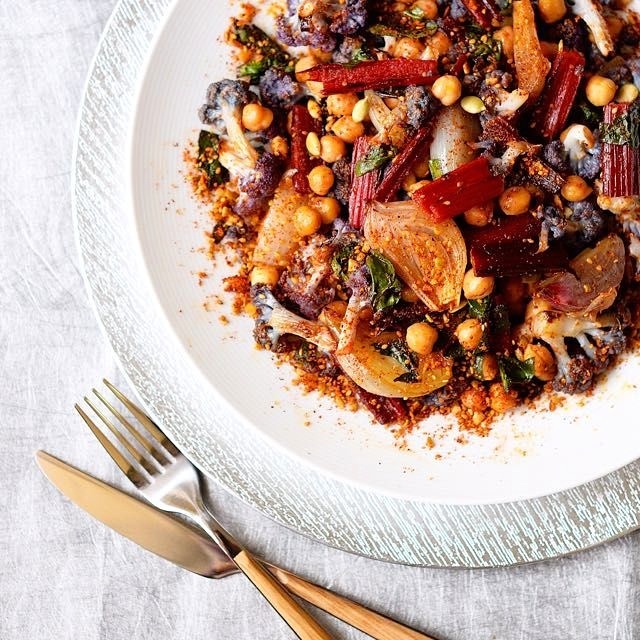 Because of it’s spice, it’s a great addition to otherwise neutral dishes. How will I know it when I see it? Look for greens with smooth, 1-inch-wide, oval-shaped leaflets arranged opposite one another with one larger leaf at the end of the stem. To pick: Crisp, green stems and leaves with no brown patches. To cook: If you do cook with it, braise or sauté it quickly, like you would kale. Cooking watercress reduces the pepperiness. Createlicious Winter vegetables at their best: roasted and flavored with a blend of Harissa, sesame seeds and pumpkin seeds.